An allergy is the body's reaction to a substance that may be harmless in itself but the immune system misidentifies and treats it as a pathogen. Antibodies, called immunoglobulin E or IgE, react by attacking the substance and in the process histamine is released by the surrounding cells which causes an allergic reaction. 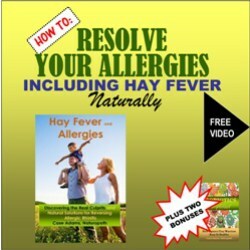 The allergic reaction may include itchy nose and throat, nausea, vomiting, diarrhea, skin irritations, hay fever, hives, asthma, high blood pressure, abnormal fatigue, constipation, or hyperactivity. A severe reaction called anaphylactic .shock will swell the larynx, obstruct the airway, and may be fatal. This is an emergency situation and remedied by an injection of adrenalin. Susceptibility to allergy can be genetic or precipitated by emotional stress. A wide range of chemicals in the environment can act as irritants. Common food allergens are peanuts, cow's milk, soy, egg whites, wheat, and shellfish. Excessive protein in the diet can exacerbate symptoms by causing the immune system to overreact. Rotating foods and eating a wide variety minimizes exposure to food allergens. 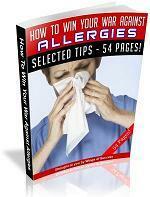 Skin and blood tests may be required to find the source of an allergy. For chronic hives, check with a physician that the thyroid is functioning properly and that there are no antithyroid antibodies present. Thyroid hormone replacement therapy may be necessary. Although they may be necessary in acute situations, commercial antihis-tamines merely suppress allergy symptoms and can cause drowsiness and depression. Vitamin C is a natural antihistamine. For hives and itching, a colloidal oatmeal product or cornstarch added to the bath can relieve symptoms. Vitamin C—250 to 1000 mg several times a day, prevents secretion of histamine by white blood cells and helps break down the compound. Quercetin—400 mg twice daily between meals, start taking 2 weeks before and throughout allergy season; also helpful for hives. Bee pollen—from local bees, start slowly before season begins; do not take if allergic to pollen. Ginger, garlic, onions, black pepper, and cayenne pepper—stimulate the production of IgA, an antibody in the gastrointestinal tract that coats a potential allergen and prevents its absorption. Ephedra—20 mg capsules, relieves symptoms of hayfever. Stinging nettle—1 to 2 freeze dried capsules every 2 to 4 hours, relieves symptoms of hayfever, hives, and itching. Garlic—has a high concentration of quercetin which retards inflammatory reactions. Chamomile—topical preparations for hives and itching. Yarrow, myrhh—contract tissues, reduce secretions, and discharges. Calendula—lotion and compress, relieves itching eyes. Witch hazel—apply topically, relieves itching. Remedies are often minute doses of the allergic substance that stimulates the body's natural healing mechanism and neutralizes the allergic reaction. Aconite, veratrum, arnica—helpful for anaphy-lactic shock until help arrives. Lavender—dilute with vegetable oil and massage on chest or sinus area around eyes. German chamomile (Matricaria recutita)—has strong anti-inflammatory properties and soothes allergic rashes, is nontoxic and can be used topically in undiluted form. Khella—relieves spasms in smooth muscle of the bronchi in hayfever, do not use on skin. Moroccan chamomile—apply externally or through inhalation, relieves allergic reactions. Melissa—relieves stress and soothes reactions. Myrtle hydrosol (myrtle water)—spray on eyelid or into eye, relieves allergic reactions and inflammation of eyes, do not use after expiration date on label. Triphala—aids digestion and eliminates toxins from the body as allergies are believed to be a result of faulty digestion; also use daily as a preventive. Pancha karma—a cleansing and detoxifying program. Herbal prescriptions prescribed for specific symptoms. Acupuncture—strengthens immune system response on a systemic level. Hypnotherapy—very effective in desensitizing allergic reactions and reducing stress. Biofeedback—training to recognize the body's response to an allergy. Can taking Magnesium help soy allergie itch?